The boom of startup industry in India has seen huge wave of talent mushrooming in the form of entrepreneurs. Sachidanand is one of those techies, who has immense expertise under his belt and found it apt to make proper use of it. He has always been a solid performer and his inputs have always been highly valued by the senior members of all companies he has worked with over the years. He has been a very strong manager as well as a results oriented person. His peers have always found him full of energy and with lots of enthusiasm to help others. He was very sound in his technical as well as personnel skills. During the course of his career, he has worked on several large-scale projects, gaining ample knowledge of core technology. 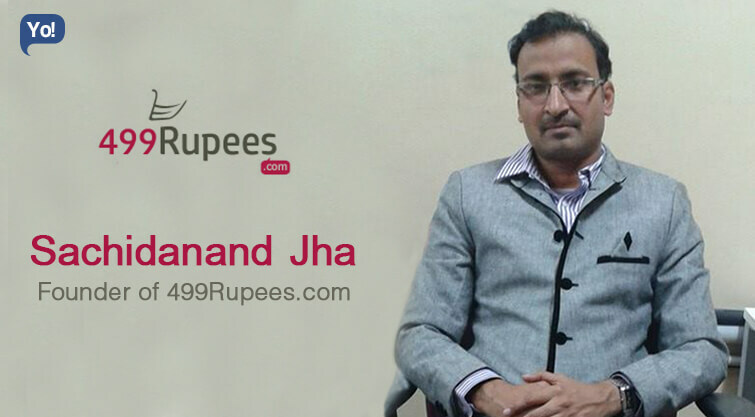 This came to help, when he decided on starting his own venture by the name of 499rupees.com. This platform deals with Coupons created to bring together the best offers and discount coupons in India for online shoppers. His vision is that the visitors will have a one-stop shop for all the best offers without crawling hundreds of deal websites. Now a days discounts like 30%, 60% is very attractive but misleading. If we buy product with 80% discount does not mean. It will be cheap enough to buy. So 499Rupees will clear this miscommunication by showing all the products within price range. As I belong to IT community so making thing easy with the help of IT is what a good life. Gone through the various stages in professional life. From Educationist to UX Developer to Product Developer. But the challenges of the transition was so big to face. Since all the profiles were taking me to different arena. So far I have invested 10 Lakhs to get the portal ready and to adding quality contents. As I have exposure of all kind of operation. I keep fresh mind and train them according to our requirement. Attrition is universal issue and by having many backup resources. We can get rid of this. Patent is what is mostly I am missing in me. Focus on one thing and give hundred % on that. Harsh words even to juniors. Hard work never goes in vein. Capture new height of success in capturing more and more clicks from click world. Will prefer to learn mobile based technology as the web based is going to be obsolete in coming days.